Once again the Hampton International Film Festival (HIFF) was five full days of fascinating events and films for movie goers to enjoy. This being the Silver Anniversary there were extra events lined up to celebrate their 25 years presenting this unique experience to enthusiastic attendees. We chart our schedule the week before HIFF starts after reading the film descriptions, locations and the time of workshops, screenwriter’s lab, Variety 10 Actors Talk, lectures and parties. The events are scattered throughout Hampton towns, so this must be considered when scheduling. Besides seeing the films, there are programs we enjoy such as Conversation with… Noted guests in the film industry speak about their experiences over the years. We’ve heard Matthew Broderick, Richard Gere, and Hilary Swank, to name a few that were interviewed by a host moderator. This year featured actor Patrick Stewart was interviewed by Steven Gaydos, VP of Variety magazine. Known for his long acting career, Stewart has earned awards on stage and screen, which include a Golden Globe, SAG, Emmy and Tony nominations. The audience heard about his early days, which started in the Royal Shakespearian Company (RSC) and tidbits about other actors he met along the way and befriended. Mr. Stewart is now best known for his role of Captain Jean-Luc Picard on Star Trek: The Next Generation, among a long list of films he appeared in over his 40 year career. Sitting in the auditorium listening to a famed actor and hearing their life story in person is a rare experience enjoyed at HIFF. There were many other films that had a Q & A session after the viewing and the actors, director, producer or composer connected with the film was there to answer audience questions. Several productions had receptions to welcome the actor to the Festival which welcomed guests that held all inclusive passes to attend. During this HIFF Annette Bening talked about her film Film Stars Don’t Die in Liverpool, a memoir about the Golden-era actress Gloria Grahame. Bening’s co-star, Jamie Bell, star of TURN: Washington’s Spies, the AMC TV series, was also there to talk about his role as Grahame’s much younger romantic partner. 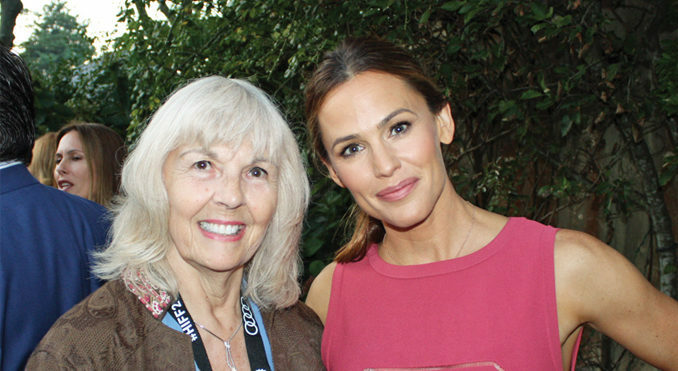 Jennifer Garner, whose film The Tribes of Palos Verdes, directed by Emmett and Brendan Malloy greeted guests at a reception hosted by Purist Magazine at the Baker House. Miss Garner was as delightful in person as she appears in those credit card commercials and was friendly and gracious to every person that came over to chat with her. The role she played in the film was so different from her in person persona and the range she displayed was harrowing to watch as the family of four lives crumbled under the beauty of the California skies. It was the World Premiere at the HIFF and certainly to be headed to theatres after its festival tour. On another morning a brunch was hosted by New York Women in Film & Television organization celebrating the entries by women in both full length and shorts categories. There are so many wonderful venues to attend that each day is fully packed. Each year an Opening Night Film is selected to kick off the festival. This year it was a fabulous film, Itzhak a documentary about famed violinist, Itzhak Perlman. The life story of this “greatest living violinists” capture the audience from the start and high praise is certainly deserved for Director/Producer Alison Chernick for this accomplishment. 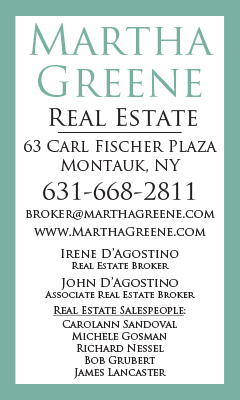 The story is told with vintage photographs, film clips and current interviews of Mr. Perlman and his wife, Toby, in their New York City apt. She is also an accomplished violinist and they met when both attended violin camp as teens one summer. Itzhak was born in Tel Aviv to parents that were natives of Poland. The family moved to the United States when he was a boy of only ten so he could study at Julliard. Having contracted polio when he was only three, it was a difficult start that he overcame when his musical genius began to be recognized. 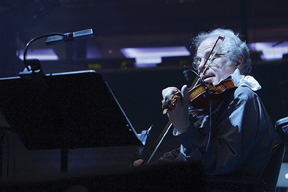 Throughout the film viewers saw and heard the fantastic personality of Itzhak Perlman shine through despite the hardship of his early life and illness. Particularly humorous was his descriptions of the street signs as he visited Tel Aviv during the filming this documentary. Some HIFF films are shown in theatres around the country, while others might be on cable or Netflix. Presented by The American Masters series on PBS stations, watch out for broadcast dates for Itzhak, so you don’t miss it! At the end of the film, the audience applauded enthusiastically, which was well deserved. Often there is a Q & A after the film where someone involved in the making of it comes on stage and chats with a moderator. The Director, Alison Chernick and his wife Toby came on stage after the film for a few moments to talk. Then the evening’s surprise, Itzhak Perlman came on stage. He was greeted with thunderous applause and a standing ovation! The excited continued as eight young adult students from his music camp came on stage to play with Mr. Perlman, thrilling the audience even more. It was a fantastic, outstanding Opening Night film made even more special by Itzhak Perlman’s appearance! 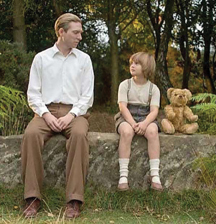 Billed as a “Centerpiece Film”, Goodbye Christopher Robin is the full title of the life story of the author A.A. Milne. Directed by Simon Curtis, who also had My Week with Marilyn in the 2010 HIFF, this was a sensitive portrayal of the little boy that was the feature character in the Winnie the Pooh book series. Milne was inspired to write his stories after seeing his only child playing with his stuffed animals and using his imagination to keep him company. The opening scenes of the film were beautifully photographed and instantly the quality of the film is recognized within minutes and carried throughout its entirety. What one thinks before viewing this film is how happy Christopher’s life must have been featured in a world famous book series. Think of the Harry Potter success today of J.K. Rowling and it is easy to picture, if there were a real life Harry, how fans adoration would be overwhelmingly disruptive to life. Viewers are quickly immersed in Christopher’s life and seeing how fame was not something we’d come to envy. This film is not a children’s movie or whimsical tale. Newcomer Will Tilson (Christopher Robin) is absolutely adorable and his dimpled smile melts your heart. The strong performances by Domhall Gleeson, as A.A. Milne, and Margot Robbie as Christopher’s mother, complete this sensitive, enchanting and touching story. Margot Robbie was on the HIFF Red Carpet for this and a second film she starred in, I, Tonya about the figure skater, Tonya Harding. Film trailers for Goodbye Christopher Robin are on TV commercials, so it has been theatrically released. Try not to miss it. You will never look at storybook characters and the fame it brought its authors the same way again. The Montauk Sun thanks FrankPR and their team for their help, assistance and information throughout the five days of HIFF. With hundreds of films in the Festival and press representatives from around the world and country attending this event, their task of supplying updates and schedules was vital to keep the information current for journalists and reporters. Their tireless efforts and friendliness was truly appreciated!